Removes excess oil & harmful impurities. Contains Lemon Extract for a radiant & even complexion. Gently cleanses without drying out the skin. Added Vitamin E leaves skin feeling moisturised and nourished. 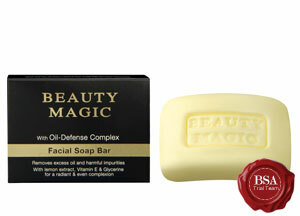 I recently started using beauty magic bar soap and I like to admit that by just using that soap twice a day my skin’s oiliness decreased and in addition my skin become more radiant than even. The soap bar has made my acne spots lighter in just two weeks now I have decided to combine it with tissue oil. I know it will work wonders, thank you beauty magic.